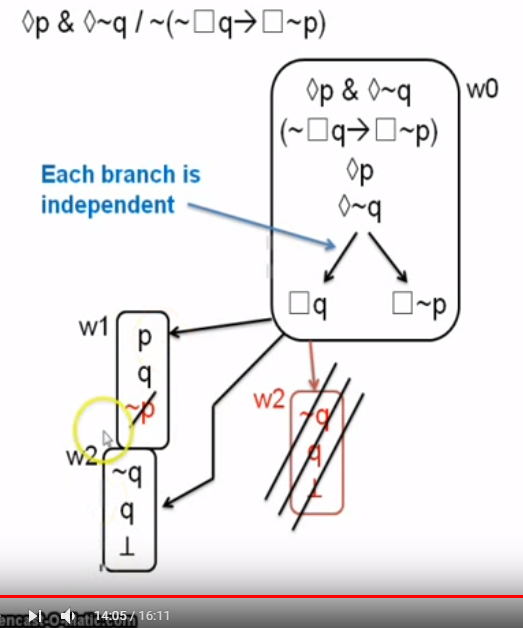 I am watching "Modal logic 1.2 - truth trees for system K" presented through Kane B's channel. The standard propositional truth tree diagrams are not a problem. Where I am having trouble is opening worlds in the tree diagram and closing branches with these opened worlds. I don't see why I am justified in closing a whole branch if some worlds in that branch do not have a contradiction in them. At about 14:00 in the video the presenter states, "If we derive a contradiction in either of these worlds the whole branch closes." Shouldn't we close all worlds prior to closing the whole branch? I don't see why stacking the worlds justifies the step. Creating world "w2" was not permitted without the stacking. Up to the branch in w0, we have only propositional logic rules. Then we go on on the right branch first : □¬p. We apply the modal rule for ◊ with ◊p: we need a new world w1 such that w1 ⊩ p.
But from w0 ⊩ □¬p it follows that w1 ⊩ ¬p and we have the contradiction closing the right branch. Now for the left one with □q; we apply again the modal rule for ◊ to ◊¬q. This step needs a new world w2 such that w2 ⊩ ¬q. But from w0 ⊩ □q it follows that w2 ⊩ q and we have the contradiction closing also this branch. "Worlds" behave exactly as the "single universe" of classical logic : they cannot tolerate contradictions. v(□A,w)=T iff for every world w′ in W we have : v(A,w′)=T. The rule states that □A is true (at a world w) exactly when A is true in all possible worlds. v(◊A,w)=T iff for some world w′ in W we have : v(A,w′)=T. The rule insures that ◊A is true just in case A is true in some possible world. A branch represents what would follow if X were the case. If you get contradiction anywhere in that branch, that means that X cannot be the case, so it doesn't matter what happens elsewhere in the same branch. More specifically, in your example, the branch under consideration represents the possibility that the following are true: ◇p, ◇~q, ◻q. What follows is that there must be two worlds, w1 and w2 (note that it's possible that w1=w2, but we can ignore that), such that w1 contains p, q, and w2 contains ~q, q. But that means that w2 contains a contradiction, which is impossible. So ◇p, ◇~q, ◻q together entail a contradiction. Thus the branch representing this possibility must be closed. What the main reason for Bertrand Russell's skepticism and rejection of modal logic?